Princess Elisabeth of Hesse and by Rhine, whose full name was “Elisabeth Alexandra Louise Alice”, was the second child and daughter of Princess Alice of the U.K. and Ludwig IV, Grand Duke of Hesse and by Rhine. She was born on November 1, 1864 in Bessungen, Hesse. Through her mother, she was the granddaughter of Queen Victoria. When Elisabeth was born, her mother strayed from the British tradition of naming children after close relatives. Instead, she named her little daughter after the ancestress of the House of Hesse, St. Elizabeth of Hungary, who she developed a deep admiration for after visiting her shrine in Marburg. 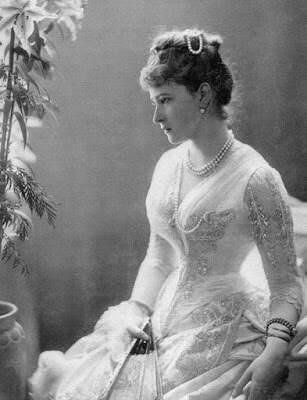 “Ella”, as she was known by her family, had one older sister – Princess Victoria of Hesse and by Rhine – and five younger siblings, including: Princess Irene of Prussia, Grand Duke Ernest Louis of Hesse, and Empress Alexandra Feodorovna of Russia. But tragedy struck the family in May of 1873 when Elisabeth’s little brother, Friedrich, died at the age of two after an accidental fall. Friedrich suffered from hemophilia, since his mother was a carrier of the disease (a trait which she inherited from her own mother, Queen Victoria). Friedrich died not from the fall itself but from the brain hemorrhage brought on by his hemophilia, which the fall triggered. Princess Alice was devastated by her beloved son’s death but, unfortunately, more grief for the Hesse family soon followed in the autumn of 1878. Every family member fell ill with diphtheria except for Alice and Elisabeth, so Alice quickly sent her healthy daughter to her paternal grandmother’s home to prevent her from falling ill. Everyone recovered from the disease except for Elisabeth’s youngest sibling, Marie, who died in November at the age of four, and Princess Alice herself, who caught the disease in December while nursing her sick family back to health. When the fifteen year old Elisabeth was finally able to come back home at the beginning of 1879, she described the tragic and grim state of her broken family as “terribly sad” and “like a horrible dream”. After their mother’s death, Elisabeth’s older sister by a little more than a year, Victoria, became her younger siblings’ surrogate mother and took over all the royal duties Alice had performed as the head lady of the Duchy of Hesse and by Rhine. As Elisabeth matured into a grown woman, she was praised for her remarkable beauty. It was even said by many that she was one of the most beautiful women in Europe at the time. With her lovely features and her pleasant and compliant personality, as well as her piety and her stately disposition, she quickly caught the attention of her older maternal cousin, the future Emperor Wilhelm II of Germany. Wilhelm was the oldest child of Princess Alice’s older sister, Victoria, Princess Royal, and when he attended Bonn University in the late 1870’s, he regularly went to Darmstadt on the weekends to visit his Hessian cousins. Here, he fell in love with Elisabeth and showed his affection by sending her countless numbers of love poems that he wrote himself. But when he proposed to Elisabeth in 1878, she rejected his offer of marriage because she didn’t care for him as anything more than a cousin. Of course, Wilhelm wasn’t Elisabeth’s only admirer. Both Lord Charles Montagu, the second son of the 7th Duke of Manchester and Louisa Cavendish, the “Double Duchess”, and a famous soldier named Henry Wilson fell for the Hessian Princess. Wilhelm’s first cousin on his father’s side, the future Frederick II, Grand Duke of Baden, also chased after Elisabeth for her hand in marriage. Although Queen Victoria was pleased with the idea of Frederick as a spouse for her granddaughter, Elisabeth declined his proposal. However, it wasn’t long before Elisabeth finally found the man she knew she wanted to spend the rest of her life with. Elisabeth’s paternal great-aunt, Empress Maria Alexandrovna of Russia, would frequently come to Hesse to visit her Hessian relatives with her youngest sons, Grand Duke Sergei Alexandrovich and Grand Duke Paul Alexandrovich. Since the Empress had visited Hesse constantly throughout Elisabeth’s childhood, she had become quite familiar with Sergei and Paul, her first cousins once removed. When she was younger, she thought the boys were conceited and aloof, especially Sergei. But as she matured, she realized that she had mistaken Sergei’s serious and religious nature for haughtiness. It was Sergei who first became interested in his cousin during their early adult years but at first, he didn’t impress her much. However, everything changed when Sergei’s parents suddenly died within a year of each other (his mother in 1880 and his father in 1881) and Elisabeth saw the grieving Sergei “in a new light”. Their similarities (she had also lost her mother and both were passionate about art and religion) brought them closer together over time. Apparently, the shy and modest Sergei saw much of his late mother in Elisabeth, which only served to heighten his affection for her. Eventually, around 1883, Sergei proposed to Elisabeth and she happily accepted. She was so in love with Sergei that she turned a blind eye to her British grandmother’s irritation at her granddaughter’s choice in a husband, since she had never favored the faraway, archaic kingdom of Russia. On June 15, 1884, the nineteen year-old Elisabeth married the twenty-seven year old Russian Grand Duke at the Chapel of the Winter Palace in St. Petersburg. Upon her marriage, she became known as Grand Duchess Yelizaveta Fyodorovna, or “Elizabeth Feodorovna” in English. It was actually at Elizabeth’s wedding that her younger sister, Princess Alix, met and fell in love with Sergei’s nephew, Tsarevich Nicholas, her future husband. The affable Elizabeth was well liked by the Russian people upon her arrival in St. Petersburg and the Russian royal family shared their subjects’ sentiments. After the wedding, Elizabeth and her husband moved into the Beloselsky-Belozersky Palace in St. Petersburg. They lived here for eight years until his older brother, Tsar Alexander III, gave Sergei the position of Governor-General of Moscow in 1892, after which they moved into one of the Kremlin palaces. During the span of their marriage, they would spend their summers at Ilyinskoe, an estate outside Moscow that had once belonged to Sergei’s mother. In the first seven years of Elizabeth’s life as a married woman, she chose not to convert to her husband’s religion, that of Russian Orthodoxy, and kept her Lutheran faith because there was no Russian law stating that a royal bride must convert to her husband’s faith. But in 1891, after becoming familiar with Russian Orthodoxy, she fell in love with the religion and chose to convert for sincere, genuine reasons – not just to please her husband. Although Elizabeth and Sergei were extremely happy together, the only disappointment in their marriage was their inability to conceive. But the couple made up for their childlessness by taking great interest in the youth of Russia in general. They would constantly host parties at their summer estates for children and they even became foster parents to Sergei’s niece and nephew, Grand Duchess Maria Pavlovna and Grand Duke Dmitry Pavlovich. Though they stayed away from the Russian aristocracy, as they refused to associate themselves with the immoral culture of the nobility, they were on great terms with Sergei’s brother, Tsar Alexander III, and his wife, Tsarina Maria. The Russian Emperor and Empress even sent Sergei and Elizabeth to represent the Romanov dynasty at various official events, such as Queen Victoria’s Golden Jubilee celebration in 1887. Elizabeth also played a crucial role in encouraging the marriage of her younger sister, Alix, to her nephew-in-law, the future Tsar Nicholas II. But Elizabeth’s happy life came to an abrupt end on February 17, 1905 when a Socialist-Revolutionary named Ivan Kalyayev assassinated her beloved husband in the Kremlin. In the afternoon of that horrible day for Elizabeth, her husband had been riding in his carriage when Kalyayev got close and threw a bomb into the Grand Duke’s lap. The carriage, along with Sergei, was literally blown to bits; Sergei’s head (his face was no longer recognizable after the blast), the upper part of his chest, and his left shoulder and arm were scattered about the snow. He was forty-seven years old at the time of his assassination. Sergei’s niece and foster child, Marie, recalled the day when her aunt heard the news of her husband’s brutal demise. She said that Elizabeth’s face was “pale and stricken rigid” with an expression of “infinite sadness” that stuck with Marie for the rest of her life. Elizabeth held her composure throughout the rest of the day as visitors came to give their condolences, saying nothing and staring blankly into space, but later on in the day, Elizabeth broke down completely. In her grief, Elizabeth took absolute solace in religion. She forgave her husband’s murderer before he was hanged on May 23, 1905 and tried unsuccessfully to get him to repent his crime. After her husband’s burial in a crypt of the Chudov Monastery, the forty year-old Elizabeth wore mourning clothes, became a vegetarian, and sold all of her richest possessions, including her beautiful personal collection of jewels and her wedding ring. She became a nun in 1908 and with the funds she had collected from the sale of her jewels and belongings, she built the Convent of Saints Martha and Mary as its abbess. Now completely devoted to her new, religion-centered existence, Elizabeth worked extensively to help the poor and the sick of Moscow. She established a hospital, a chapel, a pharmacy, and an orphanage in her convent and would often be found in the worst slums of the city trying to help poverty-stricken Russians in any way she could. 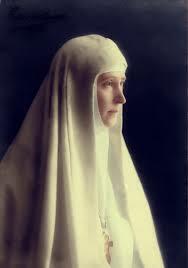 Her main focus was to create a new religious order for all women, no matter their background or class, to have an opportunity to devote their lives to prayer and helping the needy (unfortunately, the Orthodox Church didn’t approve of this idea). When World War I broke out in 1914, Elizabeth and her nuns toiled endlessly to care for wounded Russian soldiers. 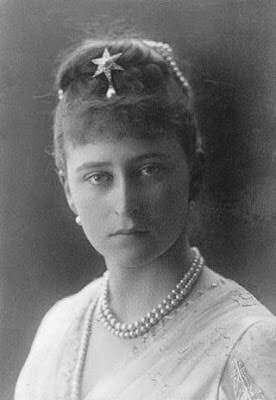 But after Russia was taken over by Lenin’s Bolsheviks in the Russian Revolution of 1918, the Imperial family (including Elizabeth’s sister, the Empress Alexandra) was deposed and held as prisoners of the Bolshevik Party. Then, Lenin commanded the Cheka to arrest Elizabeth, as she was also a member of the royal family. First, Elizabeth was exiled to Perm but later she was moved to Yekaterinburg along with a group of other members of Russian royalty. On May 20, 1918, they were taken to Alapayevsk where they were held captive in the Napolnaya School just outside the town. Almost two months later, on July 18, 1918, some Cheka officers and Bolshevik workers took Elizabeth and her fellow prisoners to the village of Siniachikha, where they were beaten and thrown into a pit. A hand grenade was tossed down onto the helpless victims to ensure their deaths but only one man died as a result of the explosion. The officers said that they heard Elizabeth leading her companions in the singing of an Orthodox hymn, so they tossed another grenade down. But again, the grenade was ineffective and the singing continued. Finally, the officers piled brush over the pit and set it on fire and left the scene. On October 8, 1918, the White Army came across the site of the pit and found the bodies of Elizabeth and her companions still inside. Most appeared to have died from their injuries or starvation instead of being burned to death by the fire. Elizabeth herself died of the injuries she received from being thrown into the pit. Before she died she was able to perform one last act of kindness when she bandaged the head of one of her dying cohorts with her wimple. The group’s remains were initially buried in the cemetery of the Russian Orthodox Mission in present-day Beijing but later they were moved to the Church of Maria Magdalene in Jerusalem. Elizabeth, who was fifty-three years old when she died, was probably unaware that just a day before she was thrown into the pit to die, the Emperor, her sister the Empress, and their children were all brutally murdered by a firing squad. But Elizabeth’s memory continued to live on; in 1981, Elizabeth was canonized by the Russian Orthodox Church Outside of Russia as well as the Moscow Patriarchate in 1992.